Read below to learn how to grow cucumbers from seeds in containers. Cucumber (Cucumis Sativus) is a fast growing summer vegetable that is a climbing vine with large green leaves and curling tendrils. You can grow cucumbers from seeds in pots and ground and can have an abundant crop if you climb the vines properly on trellis and take care of fertilization and pests problems. Cucumbers grow best outside in direct sun as compared to indoors. Continue reading on how to care and planting cucumbers at home from seeds in pots and ground including pollination, fertilization, pests, cucumber growing problems and the cause of cucumber bitter taste. Cucumbers are of different types , slicing, pickling and burpless types producing small, oblong or long size fruits. It is known as kheera, khira, kakdi in India. One of the popular varieties in Australia is Lebanese cucumber. Slicer cucumbers are generally longer and smoother and have a much tougher skin. Pickling cucumbers bear small (grow to about 3-4 inch long and 1 inch diameter), crisp and firm fruits which are used to make pickles for flavor and longer shelf-life. These pickling cucumbers have bumpy skin with tiny white dotted spines. Burpless cucumbers or Continental cucumbers are sweeter, almost seedless with a thinner skin and easy to digest. They can grow up to 2 feet long. Armenian cucumbers have very long fruit with a ribbed thin skin that does not require peeling. It is similar to tar kakdi available in India. Oriental cucumbers are very narrow and long, growing up to 18 inches long and less than 2 inch in diameter. The seeds are very less and the flesh is thick and delicious. Lebanese cucumbers and English cucumbers are small, smooth-skinned cucumbers which are almost seedless. Spherical cucumbers, known as Dosakai is a yellow cucumber available in India. Poona Kheera Cucumber, a heirloom cucumber from India, has a light colored skin that darkens to resemble a russet potato when ripe. Crystal Apple Cucumber is a heirloom cucumber, from New Zealand whose fruits are of the size of a small apple,which are sweet. Lemon Cucumber, a tennis ball-sized cucumber does not has a lemon taste, but its color like a lemon. It has a thin skin. Growing details for all the types of cucumbers including burpless cucumbers and Lebanese cucumbers are the same. I am growing various types of cucumbers in Sydney in containers and ground for several years now. Continue reading below on how to grow cucumbers from seeds in containers or garden beds. Growing cucumbers in pots is advantageous as you can start the plants earlier indoor warm environment than those planted in ground directly where you need to wait for the proper temperature to grow directly outside. You can start cucumber seedlings about 3-4 weeks in advance to get cucumbers faster. The following steps (growing vegetables from seeds) are common for planting cucumbers in containers or ground. Soil For Growing Cucumbers: Cucumber needs rich good quality free-draining soil. Mix compost (composting) or cow manure and some sand in soil. Plant cucumber seeds (if growing directly from seeds) in rows, 1 inch deep and about 10-12 inches apart. If planting in the ground, then plant on a mound about 30 cm across to improve drainage. Gently water in and then place the pots in a seed propagator at a temperature or 20 C to grow seedlings faster. If you do not have a seed propagator then place the pot into a sealed, clear plastic bag and leave in a warm bright room or (near a heater or on top of a refrigerator). Once the seeds have germinated, usually 1 to 2 weeks, remove from the bag. However, I place the seeding pot outdoor in a warm place in direct sun and keep the soil moist. The seeds sprout in 1 to 3 weeks depending on the temperature. When the cucumber seedlings grow at least one leaf, then transfer the seedling in the ground or in containers. 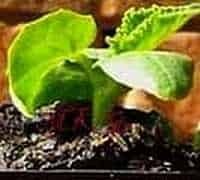 If growing in pots, then you can grow one cucumber plant in a pot of size at least 8 inch wide and 12 inch deep I grow in a large rectangular container 3 feet long and 1 foot deep and plant 5-6 plants. Cucumbers need full sun to grow well. Select a site with full sun at least for 6 hours. If you don't have a place on ground in sun, then you can grow cucumber in a large pot. The advantage of growing cucumbers in pots is that you can move the pot in sun, or even in your balcony, patio or terrace. You can grow cucumbers from seeds or buy cucumber seedlings from a garden shop and plant. You can allow the cucumber vines to sprawl on ground. But I like them to grow cucumbers vertically on trellis to save space and prevent the fruits from insects and soil damage. Vertical growing also keeps the long cucumber fruits straight. This way, I always get a very good crop of Lebanese cucumbers, Oriental cucumbers and Armenian cucumbers every year. Put a trellis so that the vine can climb to save ground space. I use tree branches as trellis that I cut from large trees. Pinch out (cut out) the growing tips when they have formed about 7-8 leaves to encourage better growth. I also pinch out the side shoots if they have not produced any female flowers even after producing about 8-9 leaves. This pinching encourages better plant growth and fruits. Put some mulch such as sugar cane mulch (which mulch you use where) around the plant to hold moisture and also that prevents weeds. The straw also prevents the fruits to come into contact with the ground, avoiding any diseases (a guide to mulch). Keep the cucumber plant damp, but do not over-water it. I water daily in the morning or evening, avoiding the leaves. Inconsistent watering or water stressed plants produce bitter fruits. The bitterness depends on the severity of the stress. Both male and female flowers of cucumber will start to emerge after 3-4 weeks. The plant produces small yellow flowers. The male and female flowers look similar, the males on long peduncles and the females on short ones. You can identify the female flower (look to the picture) which has an ovary of the shape f the fruit. First, only the male flowers may emerge so there will be no fruits. If there are very less bees in your area, then no fruits will be formed. You may notice that the small cucumbers do not grow and fall off after some days. This is because there is no pollination of the female flowers. You spray vines with sugar water to attract bees for pollination and ultimately more fruits. You can hand pollinate the cucumber female flowers also. When the flowers open in the morning, take a soft brush and rub it first in the male flower and then in the female flower. I simply pick a male flower and touch it gently at the center of the female flower. Cucumber plants need heavy feeding, so you should feed the soil with well composted cow manure. Feed with a liquid fertilizer or comfrey tea to the soil around the plant every third week after the first flower. Alternatively, mix low nitrogen - high potassium granular fertilizer in the soil. If the leaves are becoming yellow, the plants need more nitrogen. Cucumbers plants are susceptible to fungal and viral infections like any other plant . The cucumber plant leaves may turn yellow or white with spots. The viral diseases such as cucumber mosasic virus, zucchini yellows mosaic virus and watermelon mosaic virus 2 are caused by aphids and cucumber beetles. The disease causes a yellowish, mottled pattern to appear on the leaves. Powdery mildew and downy mildew are fungal diseases that cause leaves to wither and drop prematurely. The fungal diseases cause leaf spot diseases such as Anthracnose, Alternaria and Cercospora leaf on the leaves of the cucumber plant. Put straw mulch around the plant. Water in the early morning, do not water on the foliage. Avoid overgrowth to provide good air movement. Use a trellis so that the leaves do not come in contact with the ground and also helps in air circulation. Compatible Plants For Cucumbers: Beans, Cabbages, Celery, Coriander, Dill, Lettuce, Sweet Corn, Fennel, Nasturtiums, Sunflowers. Your first crop of cucumbers will be ready for harvest in 50 to 60 days after planting. You can harvest cucumbers when they about 6 to 8 inches long or before they begin to turn yellow. Cucumbers are best when they are green and firm. If you want several fruits at a time, then you may cut the stem of the fruit into half to stop supply of food to it to wait for other fruits to grow. Like that you can pick many cucumbers of the same length all to gather. Note that the more frequently you pick cucumbers and before they grow too large, the longer they will produce. You can store cucumbers wrapped in plastic wrap (Glad wrap) for about 8-10 days in the refrigerator. In a season, I harvest more than 50 cucumbers from my plants. You may wonder sometimes what makes cucumbers taste a bit bitter. The bitter cucumber is due to compounds known as cucurbitacins. The bitterness concentrates only in the stem end. Simply cut off the stem end by about an inch or two to reduce the bitterness of cucumbers. Cucurbitacin level or cucumber bitterness is high when the plant is under stress. So you should water the plant deeply and regularly. Lebanese cucumbers taste very good.